For the first time in our history, scientists are uncovering astounding medical evidence about dieting. Now Michael Roizen and Mehmet Oz translate this cutting-edge information to help you shave inches off your waist, by giving you the best weapon against fat: Knowledge. 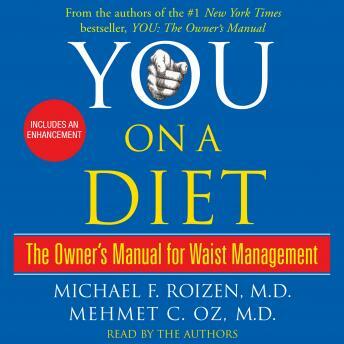 Through their signature entertaining style, Drs Roizen and Oz teach you about your body -- how and why it stores calories, burns fat, and reacts to the foods you test your body with. Ultimately, they give you the Plan and formulas that will help you lose up to two inches from your waist in two weeks on your way to your ideal size. Equal parts information, motivation, and change-your-life action, YOU: On a Diet will revolutionize the way you think about yourself and the food you consume, so that you'll diet smart, not hard. Welcome to your body on a diet. Enough with the analogies! Annoying yet useful. Get the same information from reading Self Magazine or Prevention without the annoying constant analogies. This was packed with interesting information. They make it easy to understand how your body works. The book has good illustrations of it. After hearing this, you won't want to eat any "bad" food. They alternate reading the book. One of the readers does not pronounce his words clearly. I found his voice very irritating. I was not impressed with the content and, quite frankly, did not believe all they had to say. Their other book (You the Owners Manual) was much better. I enjoyed listening and got a lot of useful information, but I suggest buying the book for the complete diet and exercise illustrations.